Technology-Portfolio.Net - Previously, HMD Global which is a smartphone company with Nokia brand has issued an invitation for the launch of the Nokia X71. The event will take place in Taiwan on the 2nd April and this will also present the Nokia 9 PureView which is the best camera from the HMD. While for Nokia X71, which will eventually be launched as Nokia 8.1 Plus globally, it will carry a 48MP camera sensor which currently seems to be a trend. The camera sensor will be accompanied by a 120 ° wide-angle sensor, and both sensors use Zeiss optics. Some renders featuring Nokia X71 reveal that this smartphone will be the first Nokia smartphone to use a selfie camera with holes, as shown in the picture below. While the screen size itself must be 6.22 inches. But it should be noted that X71 and 8.1 Plus will not be completely identical, because there will be a slight difference between the two. 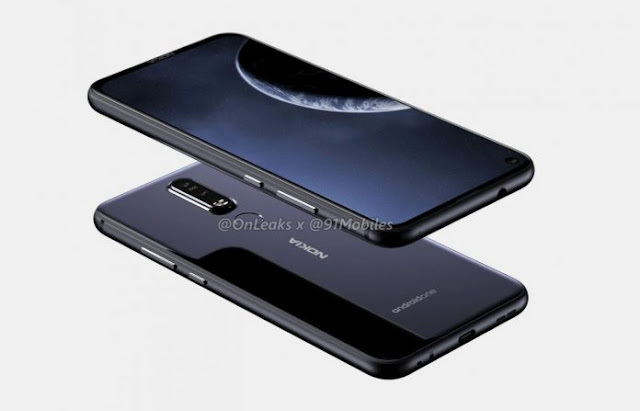 For Nokia X71 it should have a third camera on the back, although it is not yet known what type of sensor is used for the third camera. While the rendering leaks that have been circulating now feature variants that carry a dual-camera setup. Like the Nokia 8.1, the Plus variant is expected to be an upper middle class device, so even though the specifications it carries are quite capable, but the chipset used is not a flagship chipset. According to the leak, this smartphone will be powered by a Qualcomm Snapdragon 710 chipset which is pretty fast even though it is still inferior compared to the Snapdragon 845 used by the Nokia 9 PureView.